WASHINGTON (CNN) -- First lady Michelle Obama was not in Washington on Tuesday, but one might have thought so from the commotion on F Street. Crowds lined up around the block to see the new Michelle Obama wax figure at Madam Tussauds in Washington. A likeness of the first lady was unveiled at Madame Tussauds, the world-famous wax museum, with all of the fanfare that typically follows Obama in real life. A line stretched down the block outside the museum by noon, while inside, a circus of media and visitors swarmed around the exhibit for its grand opening. Dressed in a custom-designed red sleeveless dress and black cardigan, the life-size wax figure stands in the museum's replica Oval Office. The figure is beside President Obama's likeness, which was unveiled in February 2008. The museum's artists began working on the wax figure in late December, Lloyd said. While Obama did not pose for the artists, they were able to achieve a lifelike representation of the first lady by poring over photographs and video footage of her. "The hardest thing to capture is the essence," Lloyd said. "Every time you see Michelle Obama walk into a room, she just kind of takes the oxygen out of the room. She's so fashionable, she's a loving mother, loving wife, so we really hope that we capture that essence of a first lady." A quick crowd survey seemed to suggest the artists were successful, as most museumgoers thought the likeness was dead-on. "Exactly like her," said Felecia Bryant of Tampa, Florida. "I do think it captures her essence... she is a people person. She likes to go around talking to everyone. She's not too untouchable. She has a heart for people." 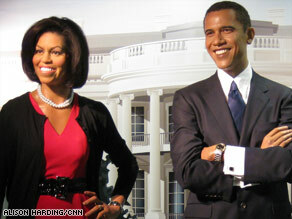 Michelle Obama is one of only three first ladies to be immortalized by the wax museum. Figures of Jacqueline Kennedy Onassis and Hillary Clinton are also on display. The museum decided to make the figure because of the high public interest in Michelle Obama, Lloyd said. "We had tons of feedback from visitors that told us, OK, you have President Obama. Where is the first lady?" Lloyd said. Since her husband has taken office, Obama has garnered unprecedented popularity, experiencing a level of interest in her fashion choices usually reserved for supermodels, and even drawing comparisons to royalty. Many of the onlookers at the museum seemed to appreciate the public's fascination with the first lady. "She's a great role model for young girls. I have two daughters, and I'm pleased that she's coming across as a strong, powerful woman," said Sandra Motusesky of Robbinsville, New Jersey. Motusesky brought her three children to the exhibit. Eleven-year-old Madelyn Tuck, however, thought the media frenzy at the museum might not have been a good idea. "It's only wax. It can melt," she said.